Surfing the holiday movies on TV, I took another peak at “White Christmas,” probably the first movie I ever saw in a theater, in my hometown of Mount Vernon, Ohio. The Vernon Theater was on the town square beside the donut shop. While these visual slices of mid-century small towns are long gone, happily “White Christmas” isn’t. 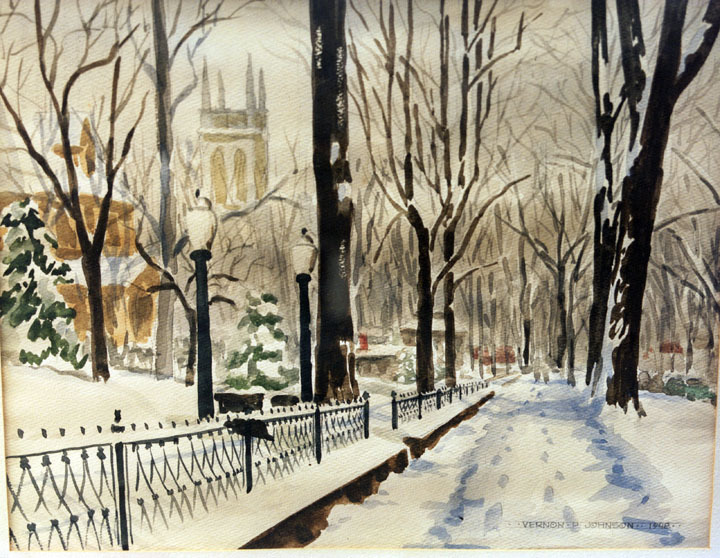 Watching the film after dismissing it for years reminded me of this winter snow painting by my father in 1948, which is one of his most favored watercolors in The Artist’s Eye book. Like Bing Crosby and Danny Kaye who starred in the film six years later, his World War II experiences were still firmly front-and-center in his identity. Fast forward to Christmas 1954 — when Crosby and Kaye along with Rosemary Clooney (aunt of today’s George) and Vera Allen produce a new show to surprise their old Army general upon his retirement. Ponytails and capris, circle skirts and pencil-thin waists, Marilyn Monroe look-alikes, ’40s dance bands, Army uniforms, athletic tap-dancing. The early ’50s still evoked images of the late ’40s but with a very modern style that permeated that transitional decade — the first half of the 1950s pulled to the past and surged toward the future. And, oh, the glamorous romance. To use one of the film’s jazzy expressions, it’s just “crazy” to remember! This entry was posted in Uncategorized and tagged 1940s, 1950s, 1950s American art, American watercolor artists, Mid-century American watercolors, White Christmas. Bookmark the permalink.